This product consists of our proprietary blend of “Volcanic Minerals-sistyle nsp+” as certified by Taiwan’s SNQ(Symbol of National Quality)certification and with its physical characteristic of absorbing hazardous microorganism, which leads to its bacteriostatic effects. While curing undesirable odors its emission of Far-infrared also boosts blood circulation and metabolism in your pets, thus helping to strengthen immune system. 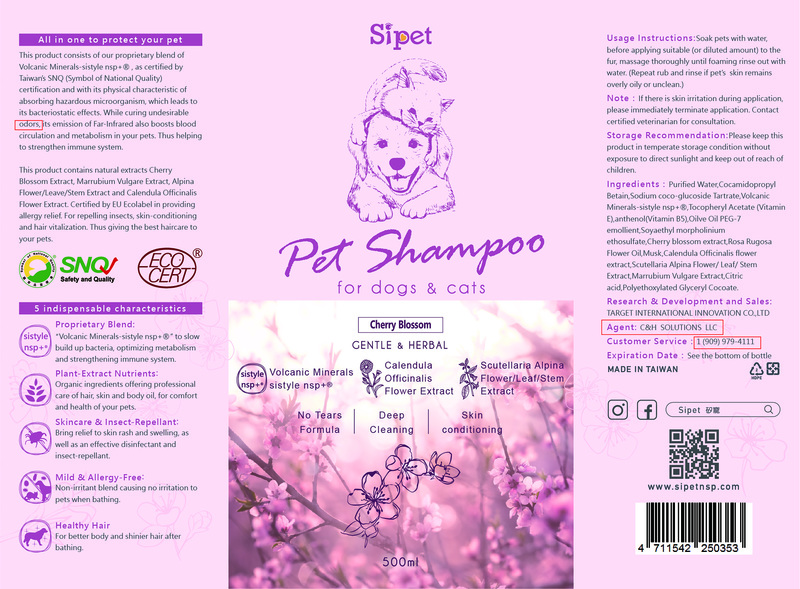 The product contains natural extracts Cheery Blossom Extract, Marrubium Vulgare Extract, Alpina Flower/Leaf/Stem Extract, and Calendula Officinalis Flower Extract, Certified by EU Ecolabel, in providing allergy relief, repelling insects, skin-conditioning, hair vitalization, Thus giving the best hair care to your pets. “Volcanic Minerals-systyle nsp+”to slow build up bacteria optimizing metabolism and strengthening immune system. Organic ingredients offering professional care of hair, skin and body oil for comfort and health of your pets. Bring relief to skin rash and swelling as well as an effective disinfectant and insect-repellant. Non-irritant blends causing no irritation to pets when bathing. For better body and shinier hair after bathing.